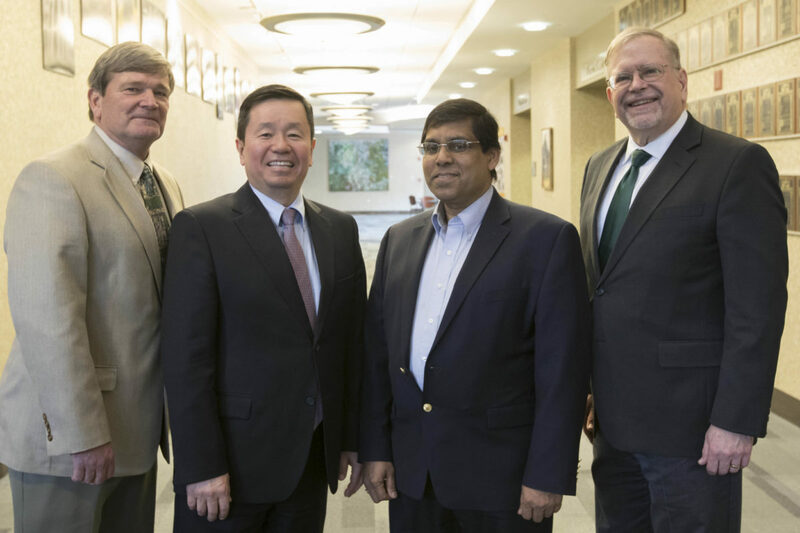 University of Missouri System President Mun Choi surprised a Missouri S&T faculty member with a President’s Award at a Cybersecurity Summit meeting in Rolla this week (Wednesday, April 11). Choi, along with Missouri S&T Interim Chancellor Chris Maples, presented Dr. Sajal K. Das, professor and Daniel C. St. Clair Endowed Chair of computer science, with the President’s Award for Sustained Career Excellence. The award, which includes a $5,000 prize, recognizes faculty who show a demonstrated and sustained record of distinguished scholarship, research or creativity for a period of 15 or more years. For more than 29 years, Das has sustained high quality interdisciplinary research in computer science. His research spans mobile computing, wireless sensor networks, smart environments including healthcare and cloud computing. He has published extensively, authoring more than 300 peer-reviewed journal articles, 52 book chapters and four co-authored books. He holds five U.S. patents. Das and his team were pioneers in conducting National Science Foundation-funded research in smart environments, and the team’s studies have received more than 700 citations. From 2013 to 2017, Das served as the chair of computer science. During that time, the department doubled its grant expenditures as well as the number of computer science doctoral degrees it conferred. He helped to establish a culture of innovation and entrepreneurship by recruiting S&T’s first entrepreneur in residence. A strong promoter of diversity education, Das took strategic measures to increase women and minority student enrollment in the department, which has increased from 7 percent to 14.2 percent since 2013. Guide2Research recently ranked Das among the nation’s top 200 researchers in computer science and electronics. The UM System President’s Awards are presented annually to faculty members across the four campuses of the UM System who have made exceptional contributions in advancing the mission of the university. Das will be formally recognized by Choi during an awards celebration to be held in June. area vital to the Country. We are privileged to have him on faculty.